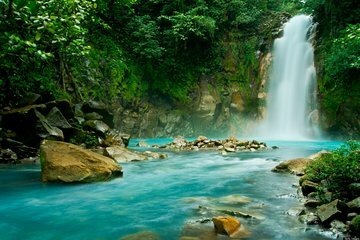 Discover some of Costa Rica's top destinations on an 8-day tour from San Jose with accommodation included at superior-class hotels. You'll see the sights of San Jose, and then head out of the city to Irazú Volcano, La Paz Waterfall Gardens, Arenal Volcano (Volcan Arenal), Tabacon Hot Springs, and La Fortuna Waterfall. As you enjoy six full-day excursions with a guide, you'll have the chance to explore the country's natural attractions and lush landscape.